Nanotechnology Now - Press Release: Can a flowing liquid-like material maintain its structural order like crystals? Home > Press > Can a flowing liquid-like material maintain its structural order like crystals? Scientists at Tokyo Tech discovered a chiral compound, which can spontaneously form a molecular assembly with an extremely large single domain structure beyond a size regime incapable of realizing with usual molecular self-assembly. The chiral compound, when heated and left to cool on a solid substrate, gives a droplet featuring a single-crystal-like structure. When the substrate is set up vertically, the droplet exhibits sliding and rotating motion controlled by the chirality while preserving the single-crystalline structural order. The scientists investigated the origin of the very unique structuring and macroscopic rotational sliding behavior. These findings will extend our understanding of the formation and motility of soft matter with a higher-order structure. Studying the crystalline structures of organic materials has enabled significant advances in both technology and our scientific understanding of the material world. Recently, a research team from Tokyo Tech, including Professor Takanori Fukushima, developed a new organic material with surprising and unprecedented properties. They designed a chiral triphenylene derivative. The chiral compound has two enantiomers whose structures are mirror images with one another, just like your left and right hand. When heated and left to cool, its enantiomer first behaved like a liquid, but then self-assembled into a higher-order structure, with unexpected results. Through x-ray diffraction techniques, the team determined that the chiral compound spontaneously formed 2D sheets (which look like herringbone fabric) and then stacked themselves into a periodic 3D structure of an ordered crystal. The most surprising aspect of this chiral compound is that, when droplets are placed on a vertical substrate and left to slide due to gravity, the ordered structure is preserved as the droplets slide and rotate. 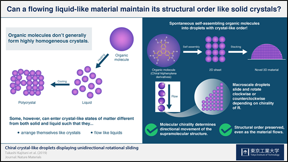 While the reason for this unexpected behavior is yet to be disclosed completely, this new material may be capable of self-restoring its structural order while sliding because it has both liquid-like and crystal-like properties. Moreover, the team found out that the chirality of the compound used determines if the rotating-sliding motion is clockwise or counterclockwise. "The fact that this macroscopic movement of the droplets can be controlled by the small point chirality incorporated into the side chains of the molecules is surprising," states Prof. Fukushima. Materials capable of preserving their structural properties at a long range would be in high demand because they could have potential applications in fields like electronics and optics. "The interesting behavior of our molecular assembly extends our fundamental understanding of the structure formation, motility, and phase of soft materials," concludes Prof. Fukushima. These findings should be intriguing and inspiring for scientists trying to elucidate the properties of organic materials, thus deepening our understanding of the structural order in soft materials, and in turn, leading to significant advances in nanoscale technologies. Tokyo Tech stands at the forefront of research and higher education as the leading university for science and technology in Japan. Tokyo Tech researchers excel in a variety of fields, such as material science, biology, computer science and physics. Founded in 1881, Tokyo Tech has grown to host 10,000 undergraduate and graduate students who become principled leaders of their fields and some of the most sought-after scientists and engineers at top companies. Embodying the Japanese philosophy of “monotsukuri,” meaning technical ingenuity and innovation, the Tokyo Tech community strives to make significant contributions to society through high-impact research.